CHICAGO, Oct. 5, 2018 /PRNewswire/ -- Combined Insurance, a leading provider of individual supplemental accident, disability, health, and life insurance products, and a Chubb company, has earned VIQTORY's highest honor as the nation's number one Military Friendly® Spouse Employer in the over $1 billion revenue category for 2019. This is the company's third consecutive year in the top five. VIQTORY Media's annual list recognizes those companies that hire spouses of active duty service members and promote workforce development policies that acknowledge the unique challenges of military life and the skills that military spouses learn through those challenges. 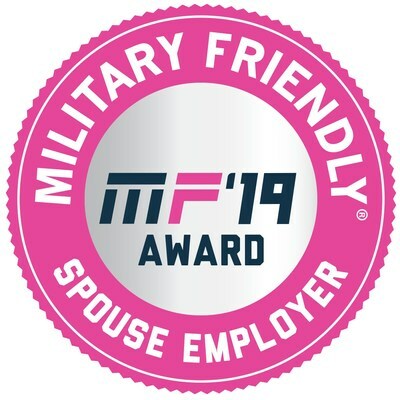 "It is truly an honor to be recognized for our military spouse hiring efforts again this year by VIQTORY," said Bob Wiedower, Vice President of Sales Development and Military Programs for Combined Insurance. Combined was also just recognized by VIQTORY as the nation's number one Military Friendly® Employer in the over $1B revenue category for 2019. This was the company's eighth consecutive year on the top 10 employer list and fifth consecutive year in the top five. "We are proud to support our military once they leave the service by providing meaningful employment, but we also want to support our military while they are still serving. One of the best ways to do this is to provide employment for military spouses—offering flexibility and portability that military spouses need in their career." Since launching its veteran recruiting program in 2010, Combined Insurance has partnered with the Department of Defense Military Spouse Employment initiative, and guarantees any veteran or military spouse an interview with the company. This partnership is an employment and career partnership connecting military spouses with hundreds of partner employees who have committed to recruit, hire, promote and retain military spouses in portable careers. In addition to providing meaningful employment, Combined Insurance also gives back to military and veteran-focused charities through employee volunteerism and corporate donations. The company has given back to organizations, such as Luke's Wings, The Fisher House Foundation, USO of Illinois and Heartland Alliance – Support Services for Veteran Families (SSVF). Founded in 2001, VIQTORY is a service disabled, veteran owned small business (SDVOSB) that connects the military community to civilian employment, educational and entrepreneurial opportunities through its G.I. Jobs ® and Military Friendly ® brands. VIQTORY and its brands are not a part of or endorsed by the U.S. Dept of Defense or any federal government entity. Learn more about VIQTORY at viqtory.com.